Royal College of Art graduate Cas Dahmen has envisioned the future of high-end waterborne public transport with an autonomous and electric hydrofoil catamaran. Designed to travel in urbanised coastal areas such as Dubai or Saudi Arabia, Hydropace is a concept for a luxury form of public transport to be used by business commuters or tourists. 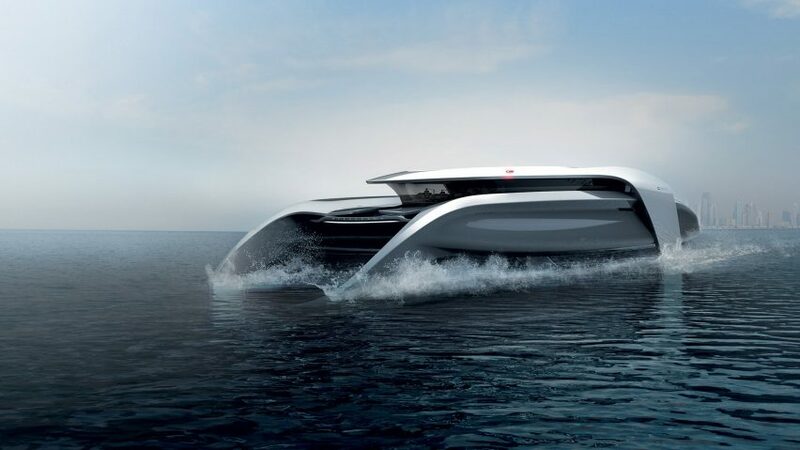 Dahmen imagined what water transport would look like in the year 2030 when designing the zero-emission concept vehicle. Fully autonomous and electric, the waterborne vehicle is designed to be a clean and quick alternative to congested motorways. It is able to accommodate up to 20 passengers, including two cabin crew members. The proposed vehicle has level five autonomy, meaning it requires no human intervention and does not need any steering apparatus. This means the front of the cabin is not occupied by helm space, leaving a more open and free interior. The twin-hulled catamaran is able to reach speeds of over 100 kilometres per hour, thanks to its electric jet power supply. Each hull contains a ducted fan, which is driven by integrated electric motors. The electric motors are powered by lithium-ion battery systems. Compressed air travels out of the fan nozzle through the hull to the rear openings in the hull where it is released into the air. Dahmen wanted the exterior design to be fluent, with an organic-shaped body that is seamlessly attached to its foils. The front foils are sculpted out of the hulls, while the rear foil is connected to the roof and wraps around the cabin. Dahmen wanted this unique shape to provide a safe, protective feeling for the passengers. A bubble-shaped glass window acts as the roof of the vehicle, to provide expansive panoramic views of the surroundings as well as creating an open interior space with plenty of natural light. Passengers can access the 40-metre-long cabin via the rear of the vehicle, which is formed of two separate platforms for entry and exit. Inside the cabin, rows of spacious passenger seating pods are connected to each other to create a balance between privacy and openness within the interior, which Dahmen likens to that of a business jet. Each seating unit is equipped with a fully transparent screen that can be operated by the passenger with a touch control pad, which is integrated into the design of the table. Passengers can also stow their belongings both underneath and in between the seating modules. The vehicle also includes bathrooms and a staff kitchen, located in the rear part of the cabin. Other Royal College of Art students looked to the future of transport in their graduate projects. Marcus Kung designed a drone that can fly without propellers, in an effort to make drones safer for casual users and bystanders.